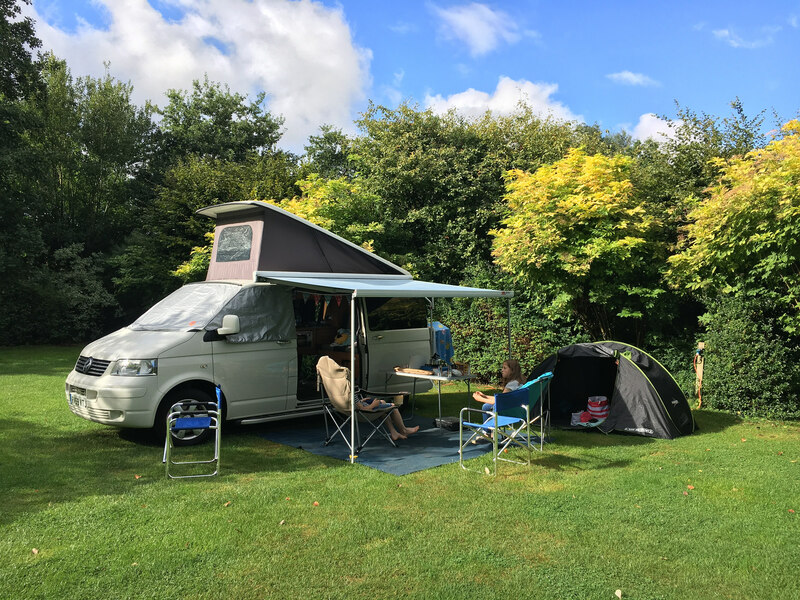 After nearly 5 years of owning VolksCamper the T5 Campervan we finally decided to fit a Fiamma F45s wind out awning. 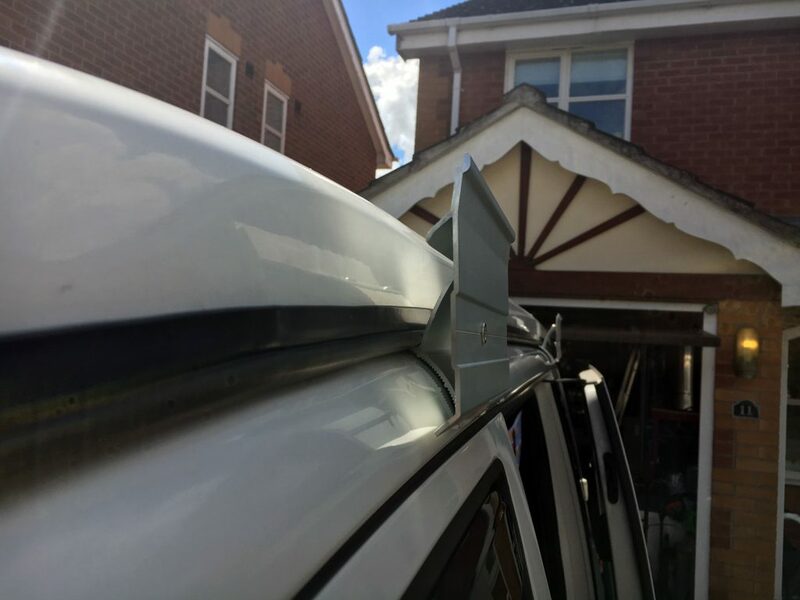 It’s a fairly simple process once you’ve purchased the correct mounting brackets for the type of roof you have on the Transporter. 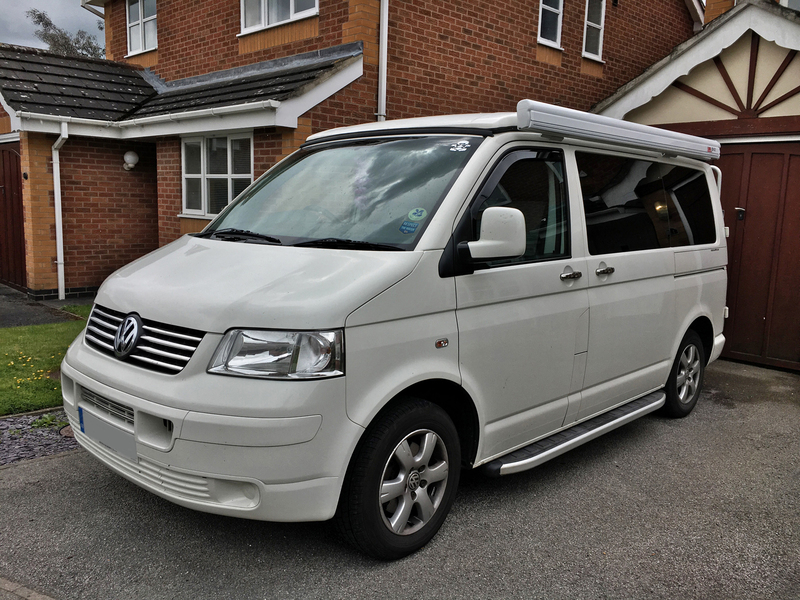 Volkcamper has a pop top roof from www.poptoproofs.co.uk so we opted for the “Kit VW T5 Multivan UK Version” brackets from Fiamma (see below). Here’s a gallery of photos showing the process. 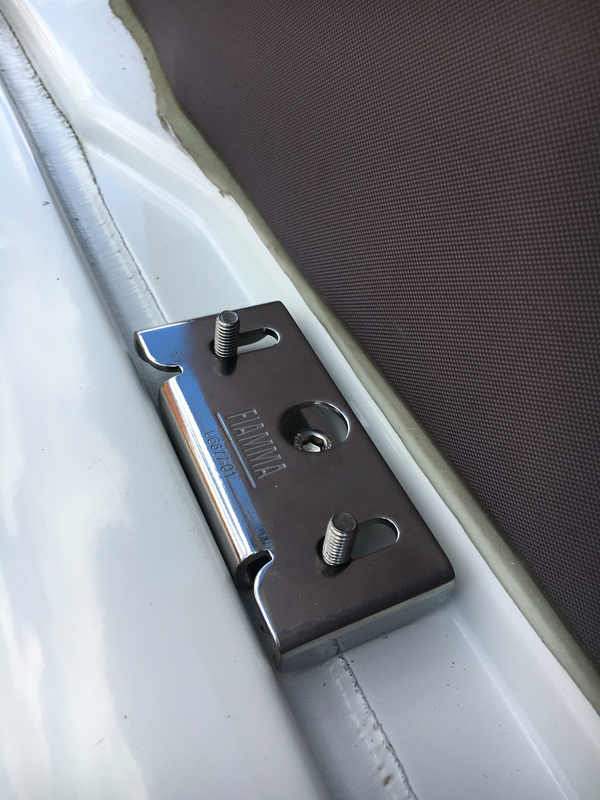 These are the Kit VW T5 Multivan UK Version brackets that bolt into the existing roof rack mounting bolts on a T5 Transporter. 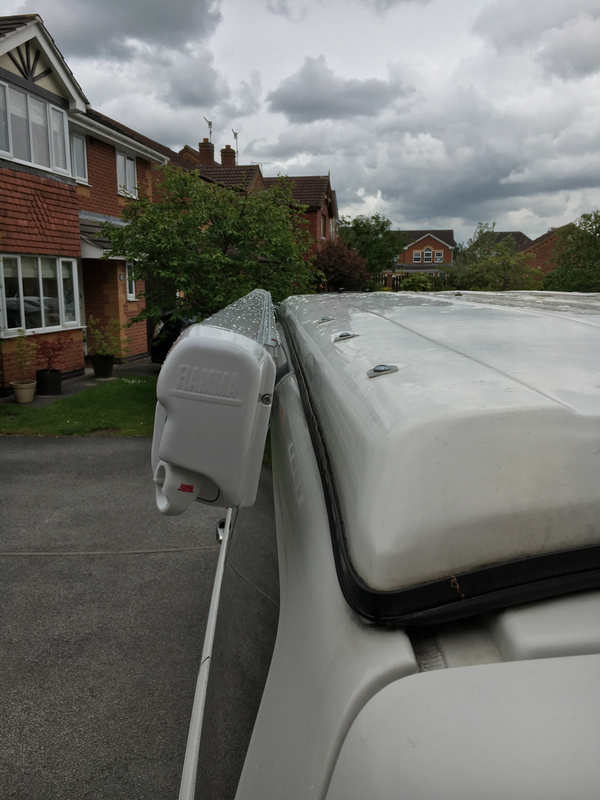 Existing roof rack mounting holes on a T5 Transporter (front). The pop top roof hinge covers the rear mounting hole but the next hole along is accessible. Place the adaptor bracket on to check clearance before applying glue. This shows how the pop top roof closes over the bracket. Checking the clearance on the rear bracket. 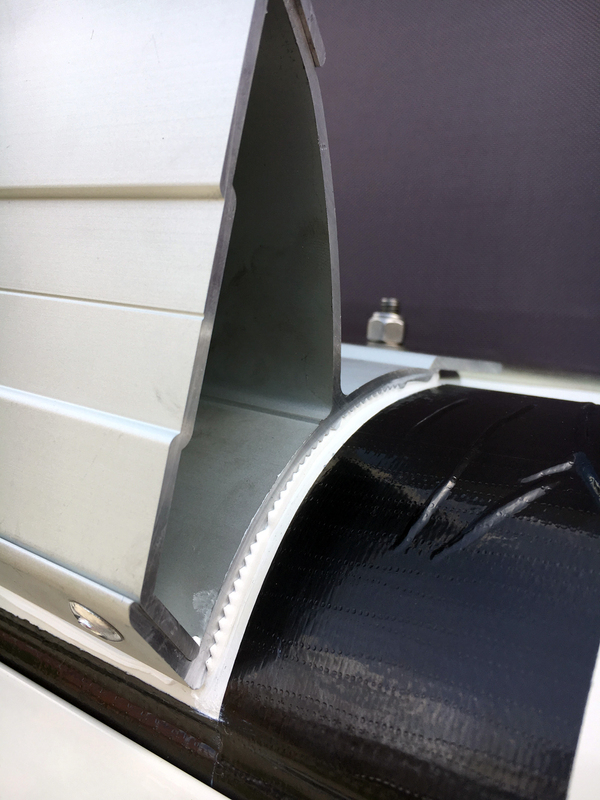 The pop top roof hinge covers the rear mounting hole so the bracket needs to be mounted to the next hole along the channel. Apply Sikaflex 252 to the rear of the brackets. 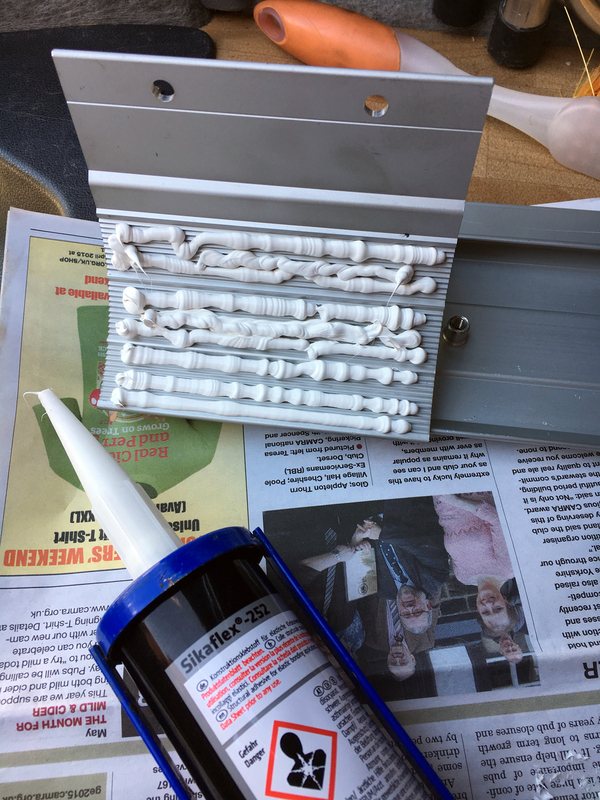 This is a bonding adhesive – not basic silicone. I used some tape to catch any over-spill. These brackets were left for 24 hours to allow Sikaflex 252 to fully harden before putting any weight onto them or fully tightening the bolts. 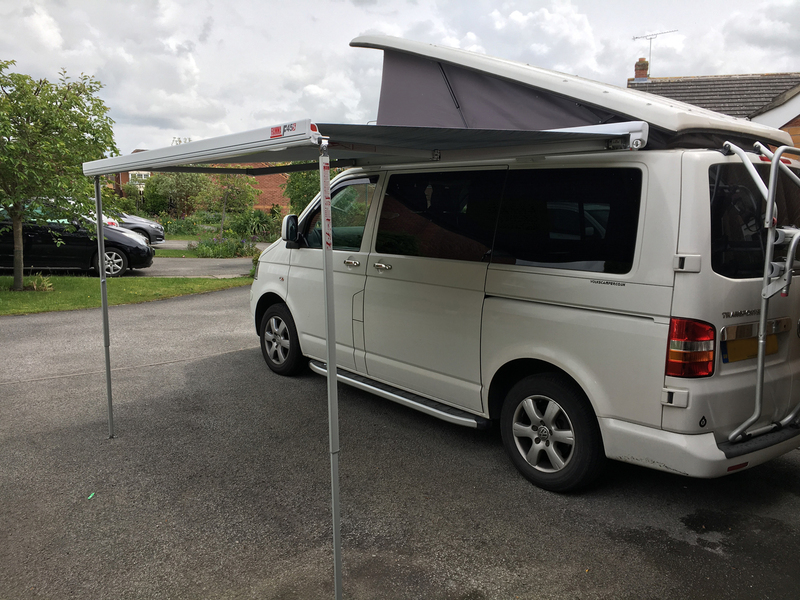 Slot the awning onto the brackets (two person job) and unwind the awning to get access to the base plate. Mark the two holes using a punch, remove the awning and drill through the base plate. 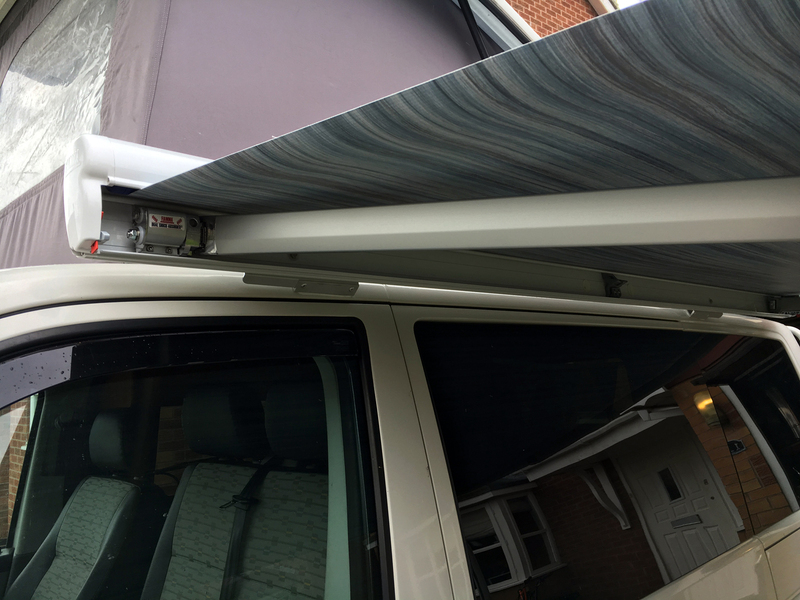 Offer the awning back up to the brackets, insert the bolts and tighten them from the inside. Completely agree with Paul’s comments. I have spent ages trying to work out what I need, and how much extra it will cost to have someone fit it once bought. Now that I’ve read this, I can see it is very straight forward, so going to get the stuff ordered and give it a go myself. Thanks very much for posting. Hi , Eric Buys here in Scotland. 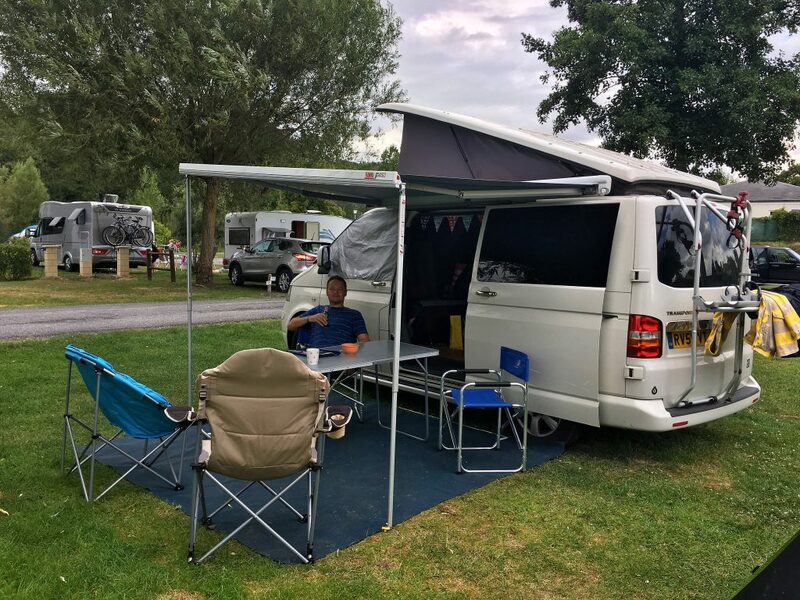 Just bought same van and awning as Volkscamper…maybe should be Kamper :-))), thanks for all your effort, another great post from an enthusiast, really appreciated. Just one question; since your rear bracket is so far from the recommended attachment point at the back has there been any noticeable flex or distortion? I was thinking of glueing a length of reinforcing aluminium strip along the back of awning. Is it necessary? Please txt if you can bother 07753597606 as I’ll be fitting it this weekend. 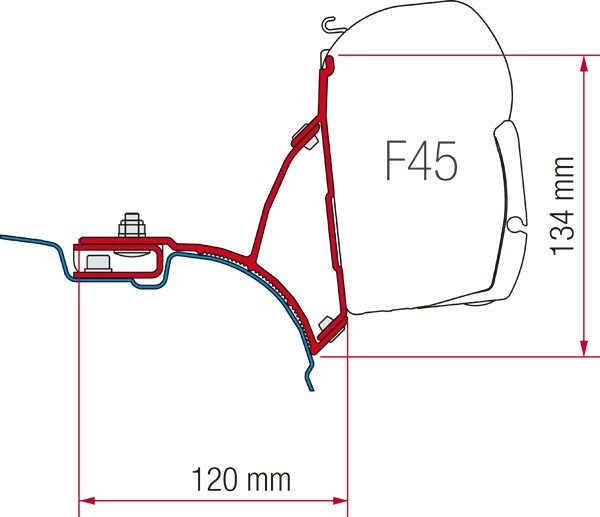 Great write-up on fitting the F45S. Looks daunting until you read this. Much appreciated. Great post , just bought a black f45s , and confirmed with guy who was selling who was not sure on brackets, showed him your post and matched the brochure. Cant wait to get if on .. much appreciated. Nice one. 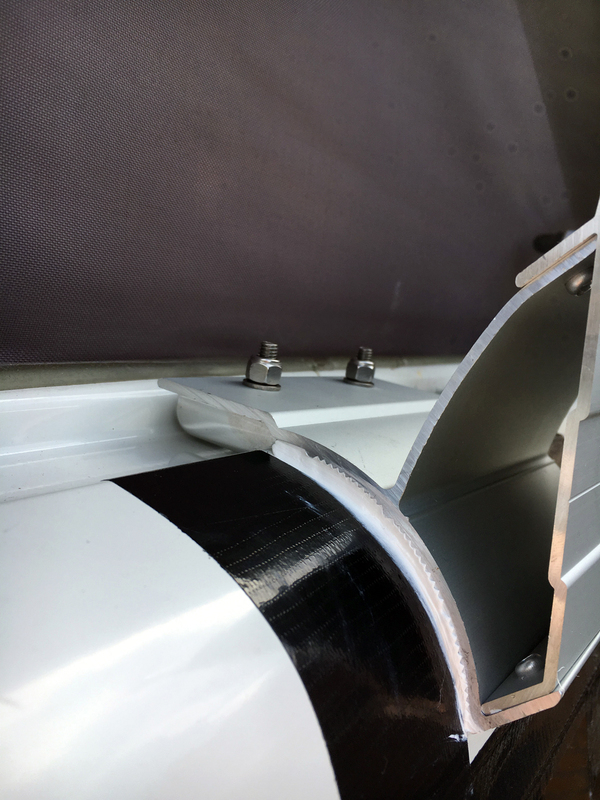 I have a long wheelbase transporter and the holes for the brackets are in the same place as the short wheelbase do you think that there would be to much overhang as the case is 3 meters long instead of 2.6? Hi Stephen, are you able to use the furthest roof holes? I think the 3 meter version needs a central mount too. Hi rich thanks for your reply,the front and middle holes are accessible but the rear hole they have covered up with the pop top hinges so I’m not sure what to do,any ideas would be good.the middle hole is in the same place as yours just past the sliding door. 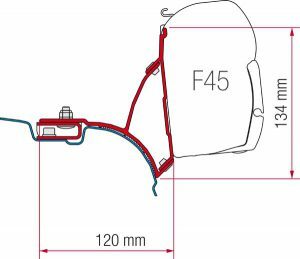 Hi Steve, I personally wouldn’t want any more overhang than I currently have (already voiding Fiamma warranty due to incorrect fitting) so you could consider fitting the 260cm version if it has the same hole placement as a SWB. The other couple of options are to modify the rear bracket by cutting away the top part of the bracket and drilling two new 9mm holes. 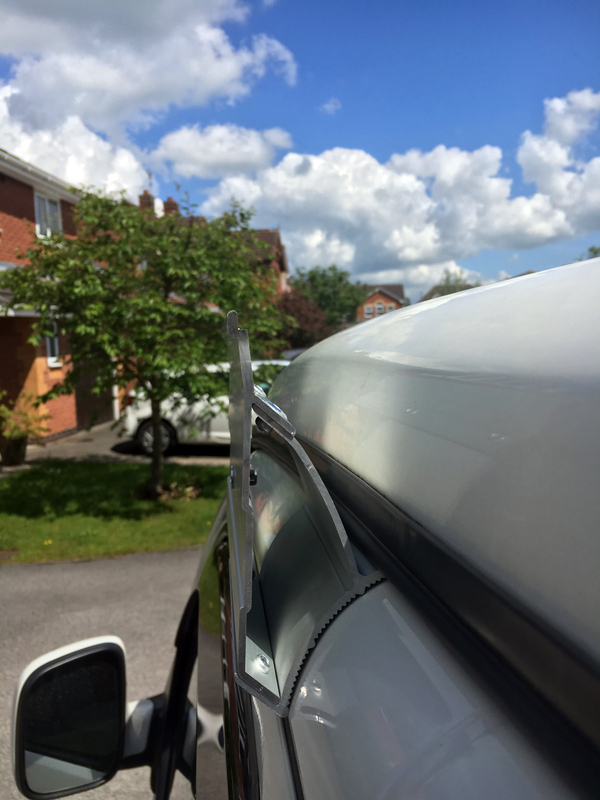 Then use two rivnuts in the van roof – also ensure you use the proper glue. Thanks rich for your help,I’m going to opt for your first option and cut and rivnut the bracket so it sits further back. 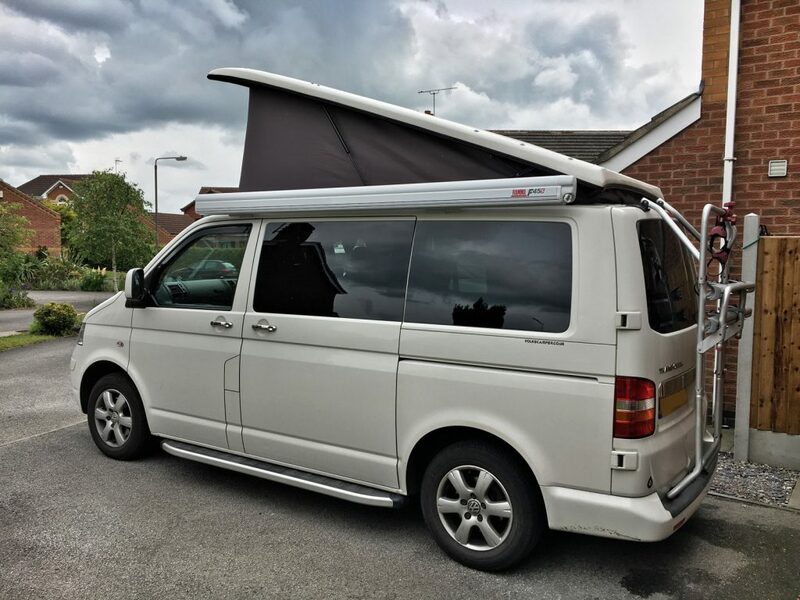 Please can you tell me if you fitted a rain guard to your awning as I am puzzled as to which is best for VWT5 lwb with pop up and f45s awning. Hi Christine, I have used a strip of plumbers foam pipe lagging. It just slips into place and is a cheap solution. I may purchase a proper rain guard at a later date but this is working fine so far. Rich. 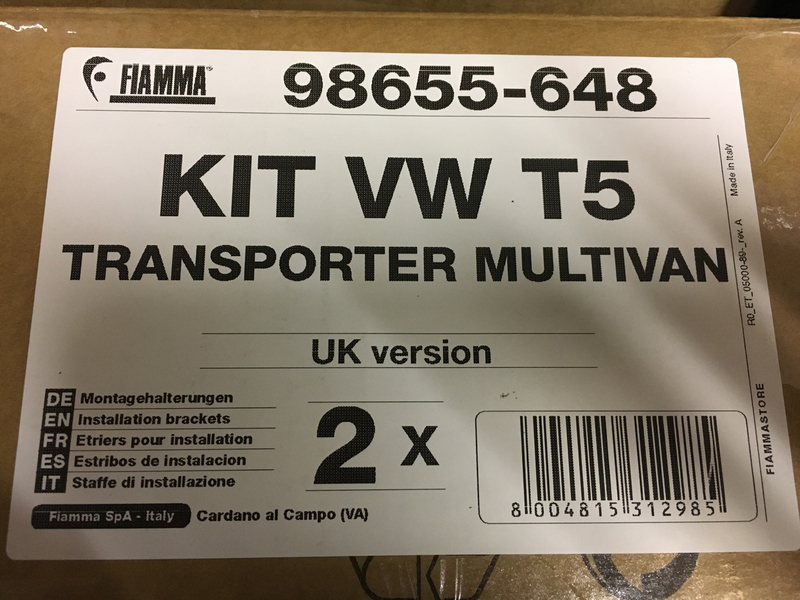 About to fit a F45ti to my T5 SWB, the kit used here looks like it will do the job but I have roof rails and the feet of the roof rails already utilise the holes that would be needed for the fiama. If I move the mounting brackets to the spaces between the roof rail feet and drill a hole in the gutter and rivnut, then fit fiama bracket to the new holes. Seem sensible? Or is there an easier way to mount and keep your roof rails? 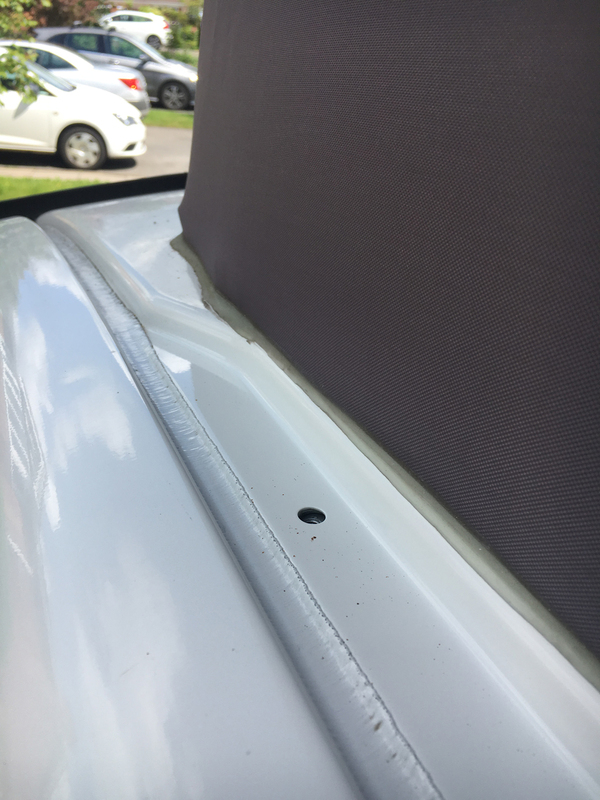 I think that when your mounting holes are already taken (by the roof rails) then I think you have the following options (click the “Brackets Installation” on each page for detailed instructions) …. For peach of mind, I’d probably go for option 1 although it is extra expense to get the rail installed. Great post Rich, did the two brackets line up ok considering that you used the hole/nut forward of the poptop hinge? I’m just about to mount mine and note that the rearmost bracket is angled offset to allow for the roof curve at the back. I’m thinking that I’ll get enough adjustment in the bed of sikaflex to allow proper line up. Please ignore my last question, just realised the kit I have is different. Hi, great site. 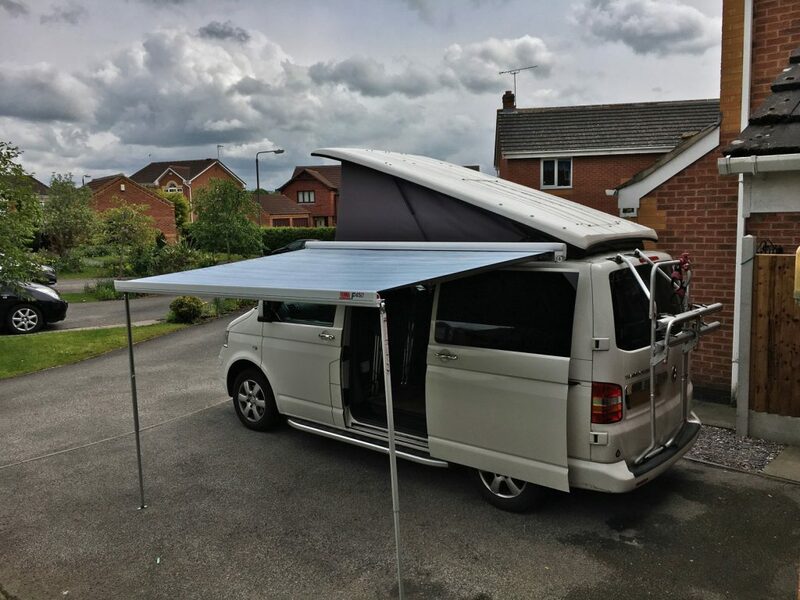 Is your Awning a 1.9m or 2.6m. Hi, Congrats on a very informative site. 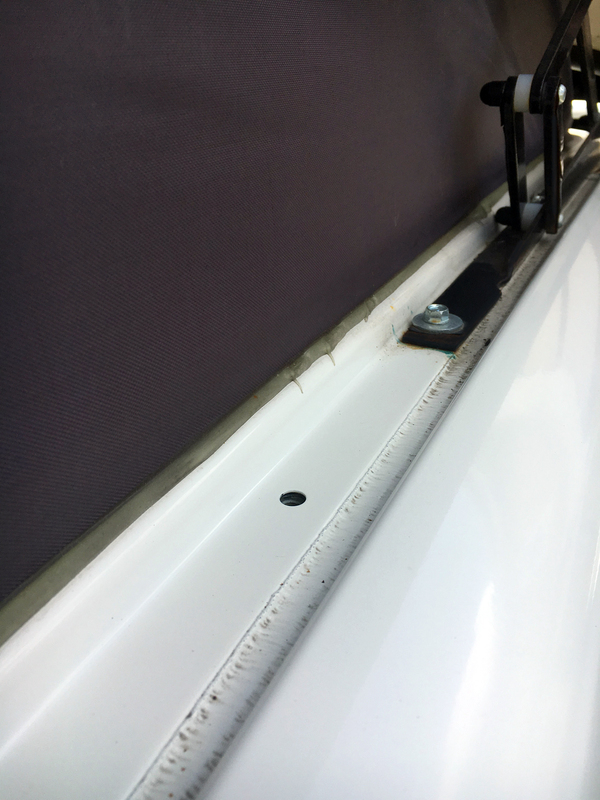 Just one question, does your awning sometimes make a whistle type of sound when driving at speed. Not every time but when it does happen it usually starts at 55/58 mph but almost every time over 70mph? Hi James, thanks for your kind comment. It does add a bit of buffering noise at speed but it doesn’t whistle. I have foam pipe lagging in the gutter to stop the water dripping down so maybe this has sealed a “whistle gap”? or perhaps it could just be an unlucky angle of one of the mounting brackets. 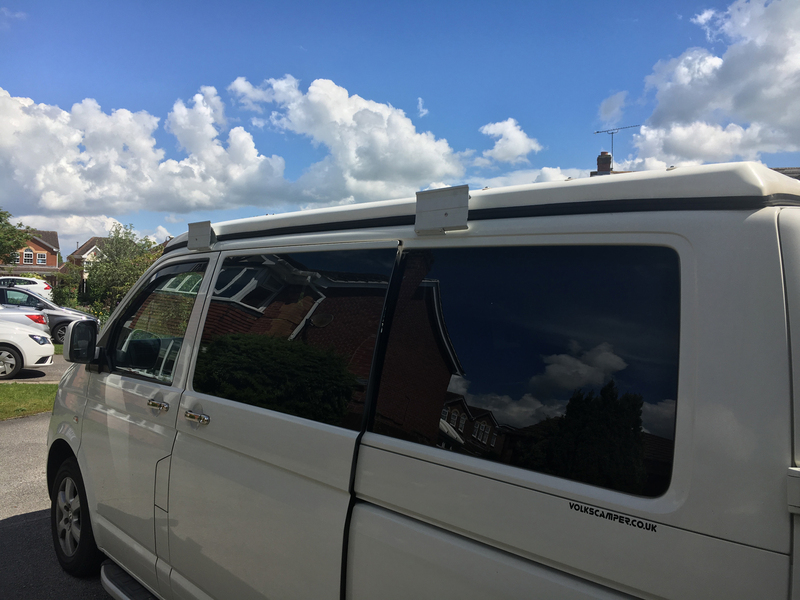 Might be worth sticking on a few bits of gaffer tape on to see if you can locate where the wind is getting in and then use some Sugru to fill the gap? Really informative guide on how to fit this great piece of kit! looks great, im also really interested to know where you store your table and chairs ? Thanks for this – youve answered quite a few questions that Fiamma dont seem to answer. Like one of your readers i too have roof rails and want to fit my brackets into the same gulley roof holes under the rail brackets. 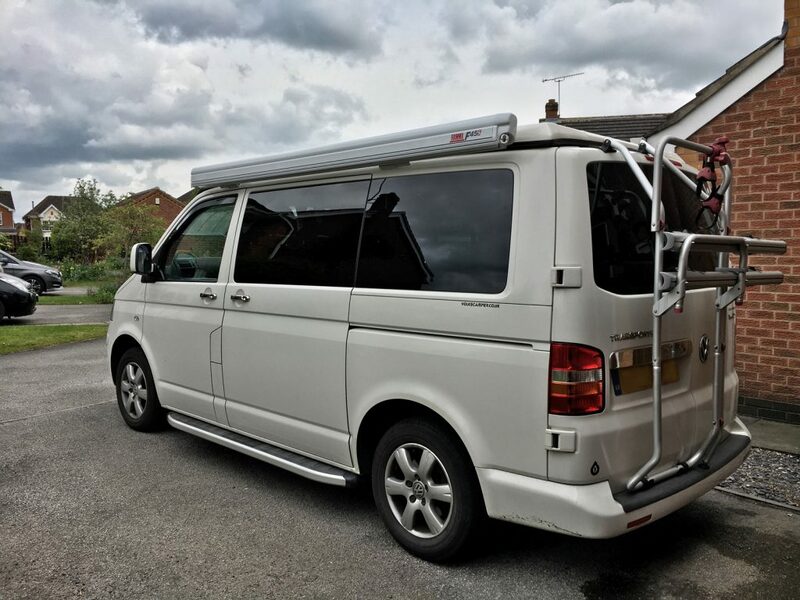 Ive ordered the same Fiamma brackets as yours and am hoping to drill them so I can fit bolts all the way through both them and the rails in one go. I may have to use threaded rod and two layers of nuts in order to fasten both items per hole. If it doesnt work then its only the brackets that ive wasted – although Im reasonably confident it can be done. I dont have the problem of a pop top to contend with. Your photos are most helpful and have given me the inspiration to have a go at this!! Cheers! Thanks for your comment Dave. Good luck! Hi, Thanks for this post. 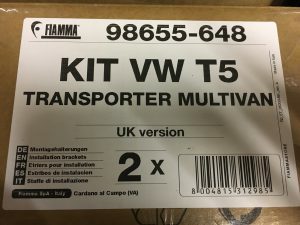 I’ve just fitted my fiamma f45s canopy as per your post. I have a S.W.B. 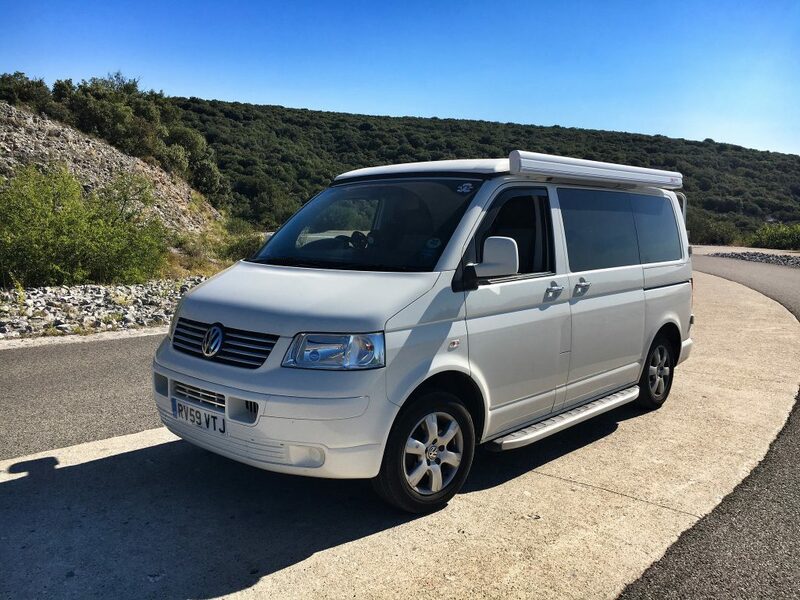 camper with a Austops elevating roof. 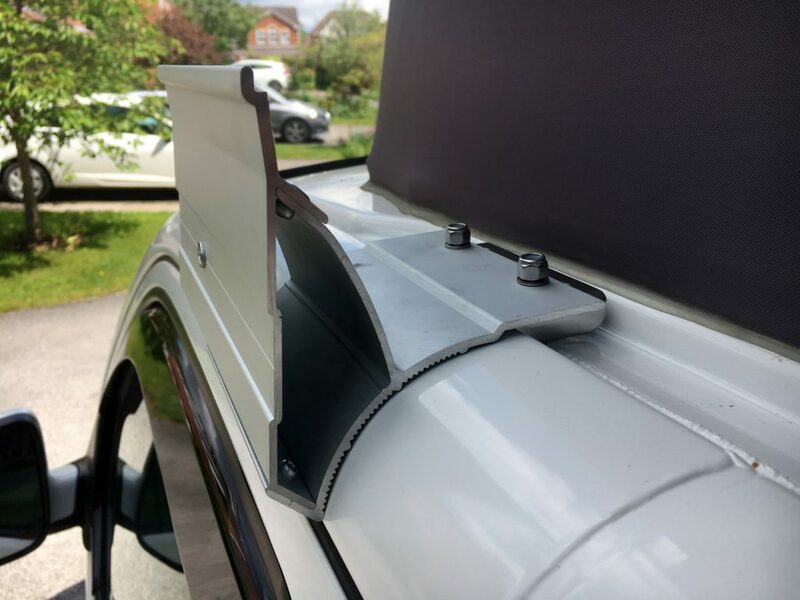 The rear bracket just about fitted before the elevating roof hinge as your pictures, the clearance between hinge and bracket closing on the roof is 2-3mm! So, it’s a tight fit! 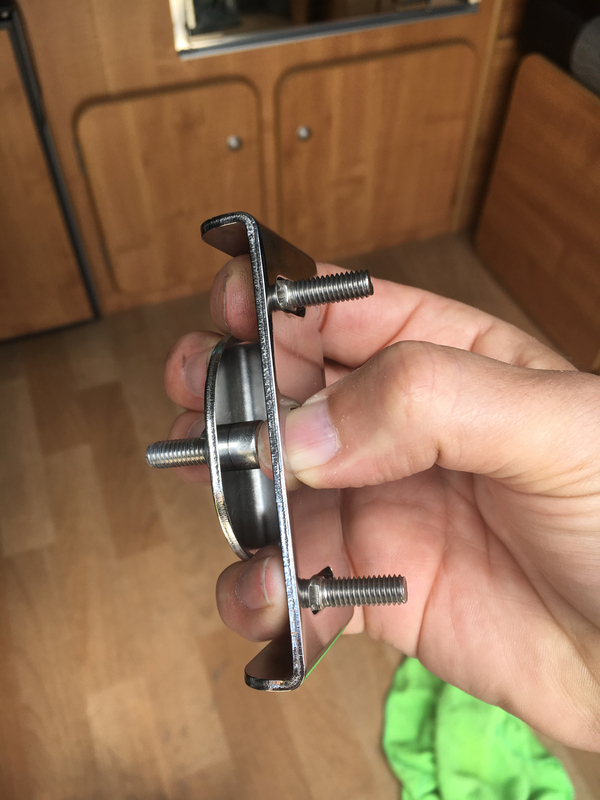 On another note in relation to the rear bracket, when fitting the bracket in the correct place, you are supposed to put 2 spacer washers on both bolts that attach the mounting bracket to the bracket that connects to the gutter fixing. This is to to bulk up the roof spacing due to the roof curve (it’s in the fixing kit instruction leaflet, if you can be bothered to read this). If your going to fit the rear bracket as per instructions here, my tip would be to use 1washer (possibly 2? – have a play and see what you think before putting sikaflex on the bracket) on the left hand side bolt only that sticks up in the rear bracket. This just improves the fitment slightly and gives a better fit when the awning drops onto the bracket. I hope this makes sense.